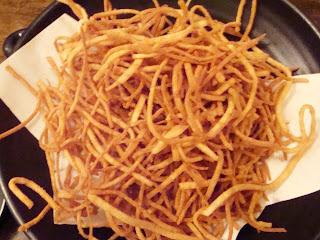 Location: 309 E. 5th St.
Feelings: Ramen and Friends' event for this month took place at Sobakoh, an authentic hand made soba restaurant in East Village. When I made the reservation for 15 people, the owner/manager was extremely courteous and asked if any special preparations were needed. I was immediately reassured that they maintained an excellent standard of Japanese hospitality. At the same time, I was a little nervous. The conversation confirmed the place to be a very traditional, authentic Japanese spot. Was I to act properly according to the Japanese manners I was taught as a child? Would my mother be proud? Once we arrived at the location, I was relieved. The staff was flexible when three additional people showed up, and we got our beverage and food rather quickly. No one went water-less, and they gave us our bill without any confusion or miscalculation, which is almost unheard of at one of our events. I was stunned by their incredible service and attention to details. Bravo, the staff of Sobakoh! Believe it or not, the food was even better than their superb service. For $10-$18, you can experience their freshly handmade soba noodles. 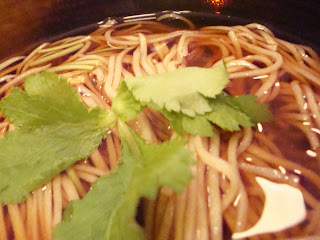 When you order "hot" soba, you can get the noodles with Tokyo style soy based broth. In the region of Tokyo, soy sauce is more prominent while the broth served in the Osaka region has more of "Dashi" flavor with much less soy sauce. As Osakan, I am not used to having soba with soy based broth, but the noodle itself was so great that I completely forgot about the broth. It was chewy and fresh. The different textures created by the inexact cut of the hand made noodle touched my tongue with delight. As I swallowed the noodle, there was another sensation at the back of my throat. It was as if the soba was alive. If you want to enjoy the noodle itself more, I would recommend cold noodles without the distraction of Tokyo based broth...Unless you are from Tokyo and you enjoy that soy broth. Everyone seemed to enjoy the side dishes as well. The tempura was light, crispy and flavorful. It complimented the taste of healthy soba wonderfully. We left the place happy and full. As I left, I noticed a small printed paper on the window. Buckwheat, the paper read, is much closer to fruit than wheat - full of wonderful antioxidants that contribute to a healthy lifestyle. Soba is so healthy! We are so healthy! So yes, of course, we stopped at Milk Bar and got ourselves heavily buttered cookies without any guilty feelings. What do you think of sobaya? I like sobaya too, but I like soba totto and sobakoh far better! too bad it's so expensive for me...been there once.